Somehow, my literary and highbrow friends tell me – yes, I have friends and, yes, many are cultivated – I am supposed to be embarrassed by saying I love the NBA. Similarly, I love Shakey’s Pizza (“foodies” disown me), I love the U.S. Postal Service (FedEx, ShmedEx) and I love taking the bus (Lexuses are for losers). As much as I adore the NBA – I would wed it tomorrow, except America is not yet progressive enough to allow human-hoops marriages, plus Toni, a.k.a. She Is The One (And Then Some), already is insanely jealous of my NBA League Pass – it could use some upgrades. 1. Since it’s never whistled, eliminate the three-second violation and allow players to pitch a tent in the lane to sell bitcoin and memorabilia. 2. All national TV games announced by Mike Breen, Mark Jackson and Jeff Van Gundy; otherwise, by Marv Albert and anybody. 3. LeBron James gets to change teams every year, and at midseason, half the roster turns over to ensure he makes the NBA Finals. 5. Every time Blake Griffin is fouled – instead of free throws – let him try to slam-dunk leaping over a Kia Optima with Kevin Federline sitting on the hood. 6. 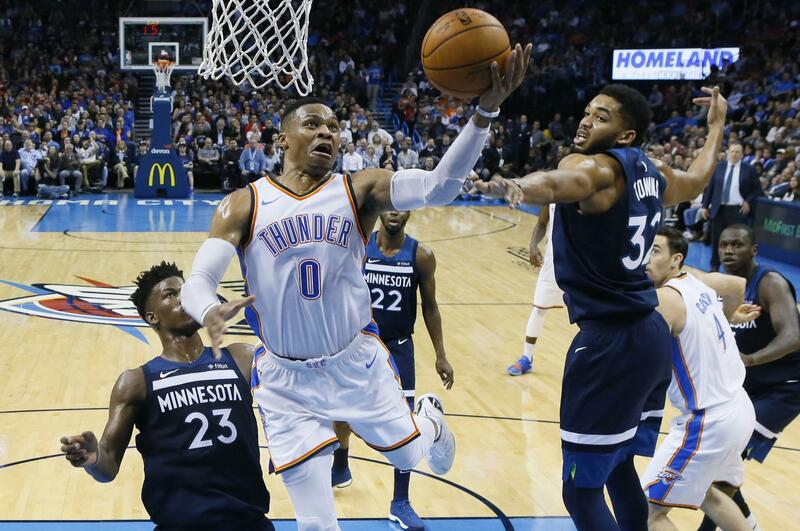 They cannot put Russell Westbrook on TV often enough; he’s more electric than electricity. Memo to Colin Cowherd: You are still wrong about Westbrook. 7. Let Steve Kerr and Doc Rivers broadcast their own games from the bench. 8. Create an NHL-style penalty box, and, just for kicks, require Draymond Green to sit in it for 15 minutes every game. 9. Statistical adjustment: When a pass leads to a 3-point basket, it should count as 1.5 assists. I’m serious, folks. 10. Bring back three-to-make-two free throws; if fouled on a 3-pointer, you get five-to-make-three, and, in the unlikely event DeAndre Jordan shoots from beyond the arc and is fouled, he gets 10-to-make-three. 11. Any game Kevin Harlan calls, his commentary is provided only via closed captioning. 12. Mark Cuban cannot attend Mavericks games, does not speak about officiating and is only allowed to comment publicly on last week’s “Shark Tank” ratings. 13. Gregg Popovich gets to the NBA finals once every three years, regardless of his team’s record. 14. NBA sage Zach Lowe of espn.com should blog eight days a week – when you write that well about something, you should write more often. Note: Nobody ever asks me to write more. 15. With apologies to all the NBA’s nascent political activism, John Oliver is a national treasure; everyone in the league needs to watch his HBO show every week. 16. Annual All-Star weekend promotion: Isiah Thomas vs. Isaiah Thomas, one-on-one. 17. You know how parking enforcement officers have ticket quotas? NBA officials should call at least two traveling violations per quarter. 18. Spike Lee does not get courtside seats. 20. Replay reviews only to clarify what Hubie Brown just said. A. Pitino says he has no knowledge of a tattoo on the left side of his back that reads “2013 NCAA Champions” along with a Louisville logo and the team’s 35-5 record. A. One time in the late 1970s, my best man Gonzo threw a beanbag chair at the justice of the peace while I slipped out into the Cracker Barrel parking lot. A. My readers make me so proud. Published: Feb. 26, 2018, 6:42 p.m.